Who doesn’t love winning prizes? If you’re heading to the beach or the pool this summer, you can win versatile lounge gear that will help you relax in style! You can turn a soft beach bag into a pool cover — with all kinds of pockets for your smartphone, headphones, and sunglasses. 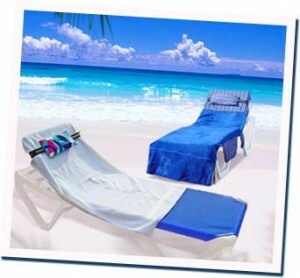 Or you can win an inflatable pillow for your lounge chair that functions as a towel strap and fanny pack. You can go to the giveaway page here. All you have to do is just follow 2 simple steps, and you’ll be automatically entered into the drawing. If you love Port Liberte, if you’ve adopted a shelter animal this year, or if you have friends who are buying or selling a Port Liberte home, tag us on a social media post or refer a friend to our website. After that, let us know how you heard about us! We can’t wait to hear from you. Know Someone Interested in Port Liberte Real Estate? If you, a friend, or a neighbor are thinking about buying a house or selling a home in Port Liberte, let me know! We can talk about calculating a home mortgage, low-cost home staging tips, and any other aspect of the real estate process.